2019 is here, and it’s time to put your knowledge management (KM) program on track for success. To do this, you’ll need a documented and actionable KM strategic plan. We all know that strategic planning is essential to the success of any business program or initiative. And yet, most of us are all too familiar with the pains and pitfalls of strategic planning. The hardest part is knowing how and where to start. Through APQC’s years of experience helping organizations build and sustain high-impact KM programs, we’ve identified four key inputs for KM strategic planning. Whether you’re cooking up a new plan for an existing KM program or starting one from scratch, these are the four ingredients you need to get started with strategic planning. What it is: Knowledge that offers a sustainable competitive advantage. What critical knowledge looks like varies by organization and industry, but often involves core products, services, processes, or business areas. Why you need it: When an organization loses critical knowledge, bad things happen: processes are performed incorrectly, and customers don’t receive the products or services they expect. The KM program needs to focus on critical knowledge to deliver the biggest impact to the business. Where to get it: Interview leaders, managers, and subject matter experts from the business areas that KM serves or will serve. Knowledge mapping is a good way to identify critical knowledge. What it is: A simple description of the business value, problems, and opportunities that a critical knowledge area brings to the organization. Why you need it: Organizations have multiple critical knowledge areas: different processes, methods, and job roles that are essential to sustaining the business. 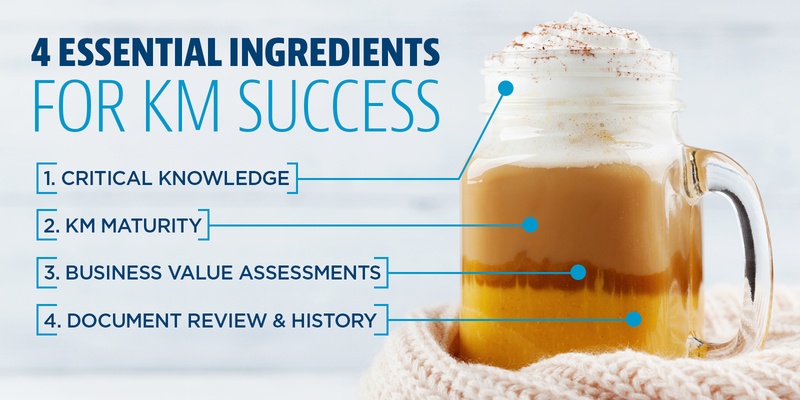 Business value assessments help the KM program focus on the most high-impact areas. Where to get it: Talk to the same stakeholders you asked about critical knowledge, either during the initial interview or in a follow-up. What it is: The current state of KM maturity for the organization or the business area that KM serves. Why you need it: Assessing KM maturity helps you determine what’s achievable for your program in the near- and long-term. Where to get it: KM maturity is best measured with an objective assessment such as APQC’s KM Capability Assessment Tool. This diagnostic provides an overall maturity rating, scores for 12 KM capabilities, and the ability to compare scores to industry and cross-industry peers. What it is: A compilation of the overall history of the organization (e.g., major initiatives, transformations, mergers, and acquisitions) and any previous KM efforts as well as current and upcoming organizational strategies and initiatives. Why you need it: Document review and history provides valuable lessons learned and ensures that the KM effort is suited to the organization’s context. If a prior initiative—KM or not—was a major failure, it’s important to know that information so you don’t repeat the same mistakes. And if a new organizational strategy is on the horizon, it’s crucial for the KM strategy to align with it. Where to get it: Interview senior leaders to identify current and upcoming company-wide strategies. Senior leaders can provide input on the overall history of the organization and any KM initiatives, but it’s also useful to talk to long-tenured employees across the company. These folks can provide on-the-ground insight into the successes and failures of past initiatives. Through the process of gathering these four inputs, you’ll start to get an idea of what objectives, goals, and activities you need in your KM strategic plan. The next step is to work with stakeholders to finalize and document the plan, secure buy-in, and develop a roadmap to implement it. For templates, worksheets, and further guidance on KM strategic planning, see KM Essentials: Strategic Planning for Knowledge Management.